TAPcast is an educational podcast created by the TA Project based at the School of Graduate Studies at Rutgers University–New Brunswick. Professors, graduate students, administrators, and other members of the Rutgers educational community discuss issues regarding pedagogy in the contemporary classroom. Subscribe and learn more about current trends in university instruction, hear creative tips about managing your time in and out of the classroom, and discover resources for expanding your pedagogical repertoire. A few brief announcements from the TA Project team: We're taking a break for the holidays. New episodes will return in mid-January. When we return, new episodes will now release once a month. In the spring, we'll do an episode answering your questions, so keep an eye on our Facebook and Twitter for how to submit your questions. Happy Holidays from all of us here at the TA Project! In this episode of TAPcast, we talk with Dr. Dan Stern Cardinale and Dr. Christy Beal about the recent course transformation of Intro Biology. They tell me about the course structure both pre- and post-transformation, as well as the factors that provided the push for change. I ask them about how active learning is incorporated in the new model and how that is reflected in the course assessments. Finally, they share some insights and advice for other programs looking to revamp their mega-courses. For more information, check out our website tap.rutgers.edu/tapcast.php. In this episode of TAPcast, we talk with Eva Erber and Eilis Kierans, PhD students in the German and Italian Departments respectively, about their experiences teaching language classes. After describing some of the activities they use, they tell us about some of the differences and similarities between teaching in their native language or another language. Finally, they both offer some advice for new TAs. For more information, check out our website tap.rutgers.edu/tapcast.php. In this episode of TAPcast, Darcey Searles shares some teaching tips for TAs. At the time of the recording, Darcey was a PhD student studying Communication. As of the release of this episode, Darcey has completed her doctoral studies. Throughout the episode, Darcey shares some of her teaching experience such as strategies for starting the semester on the right foot. She shares some of her syllabus policies and the philosophies behind them. Finally, we talk about balancing teaching with research and she shares some of her tips for new TAs. For more information, check out our website tap.rutgers.edu/tapcast.php. In this episode of TAPcast, we talk with Matt Charnley and Sandra Medina about their experiences with active learning. We discuss some potential difficulties in using active learning techniques as well as their strategies for overcoming those challenges. They share some of the activities they've incorporated into their classes that have gone well. Finally, they share some advice for new TAs who want to try using active learning. For more information, check out our show notes at tap.rutgers.edu/tapcast.php . In this episode of TAPcast, we talk with Associate Teaching Professor Michael Weingart from the Department of Mathematics. We discuss selected math courses for non-majors and his efforts to create hybrid and flipped models of those courses. Specifically, I ask him about the pros and cons of such approaches and what goes into creating them. Finally, he offers some advice for those interested in creating flipped or hybrid courses. You can find more information and our show notes on our website: tap.rutgers.edu/tapcast.php. 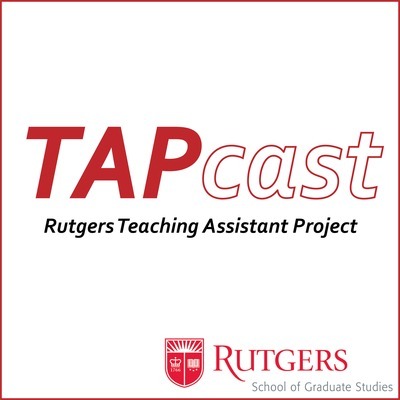 In this episode of TAPcast, we talk to Kristina Howansky, a current PhD candidate in the School of Graduate Studies at Rutgers University studying Social Psychology. Our conversation focuses on her strategies for and experiences with classroom discussions about controversial topics. I ask her about strategies for setting the right tone early in the course, ways to moderate the discussion with as little bias from personal feelings as possible, and tips for helping students to feel comfortable sharing their personal experiences. We also talk about diversity in the classroom and how that can affect these difficult conversations, as well as what these conversations look like in a hybrid course. Finally, Kristina tells us about getting students engaged and motivated though growth mindsets and comedy, such as her “potato project.” You can find more information and our show notes on our website: http://tap.rutgers.edu/tapcast.php. In this inaugural episode of TAPcast, we hear from Senior Associate Dean Barbara E. Bender, the Director of the TA Project. We talk about what the TA Project is and how it got started. We discuss how it has evolved and what it looks like today. Finally, we spend some time talking about the necessity of training for graduate student TAs. You can find more information and our show notes on our website: http://tap.rutgers.edu/tapcast.php.